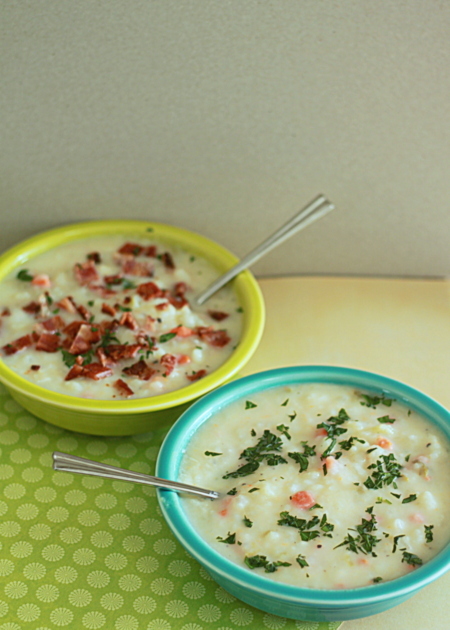 Creamy, hearty, rib-sticking potato soup with optional bacon for the meat-eaters. 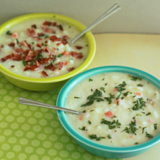 It's so easy to make, and at less than 50 cents per serving, this easy potato soup recipe is just a winner all around. I originally posted this recipe on my first blog a couple of years ago. Come wintertime, it’s a regular in our rotation. The fact that it’s a hugely frugal dinner is a bonus; we just love how delicious it is – not to mention how easy it is to make. Simply cook up some bacon for the meat-eaters to crumble over the top and the whole family will clamor for more – vegetarians and meat-eaters alike. 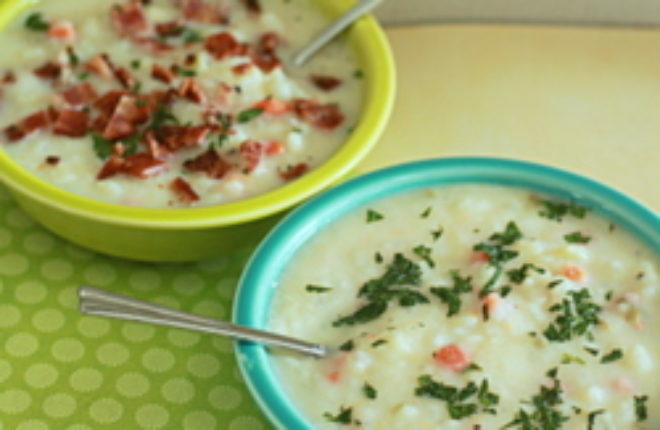 And so, introducing: 45 Cent Potato Soup! It’s super easy to whip up a pot of this hearty and flavorful soup, and it’s one of my go-to weeknight meals for that reason. It’s great comfort food for a blustery cold day, perfect with a big hunk of crusty bread. And did I mention that, by my estimation, it costs only about 45 cents per serving? In a large pot over medium heat, add the potatoes, onion, celery, and carrots. Add water to about 1/2 inch below the top of the vegetables. Heat on medium, stirring occasionally, until the mixture comes to a boil. Reduce heat to low and cover. Simmer for about 30 minutes, until all the vegetables are soft. 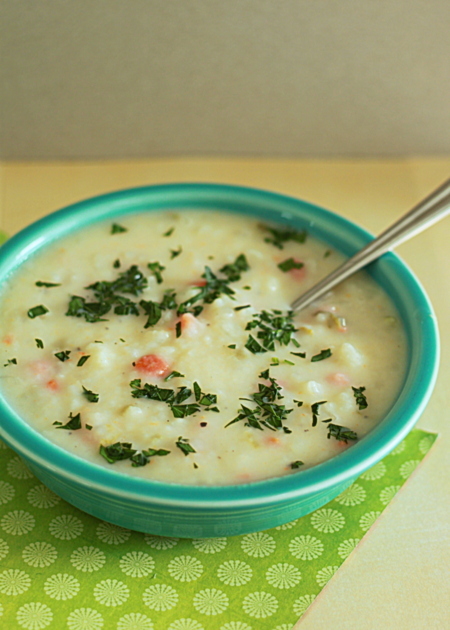 Using a potato masher, carefully mash most of the soup, leaving a few chunks for texture. Stir in the milk and the parsley. Add salt and pepper to taste. The soup will take a lot of salt - I usually start with a teaspoon of kosher salt, taste, and end up adding quite a bit more. Over low heat, return the soup to a simmer. Serve topped with additional parsley, butter, bacon bits, grated cheese, or any other topping you dream up. Comfort food on the cheap. Rap about that, Fiddy! YUM. I am so making this tomorrow night! Who knows how to PAR-TAY on a Saturday night?! ME!! LOL! Topped it with toasted squash seeds, really yummy. Thanks! Made it tonight for company Kare, and OH MAN it was good!! Thanks, what an easy meal. 🙂 That’s in the rotation permanently. I also made Pioneer Woman’s Onion Rosemary blue cheese bread to go with it. MMMMM! I put some chives in the bread, and chives as a garnish for the soup and it was wonderful. Andrea and Sonia, I love this feedback! 🙂 Toasted squash seeds, that sounds amazing. And with Pioneer Woman’s onion rosemary blue cheese bread? Perfect. I’ve been meaning to try that recipe. I just made this without the celery and added extra carrots and some baby clams and cheese to make a sort of clam chowder, and it was great! Super easy and really delicious. And I’m in a dorm, so if I say it’s easy, it definitely is! Thanks so much! I’m so impressed that you’re making from-scratch meals in your dorm room! Nice! 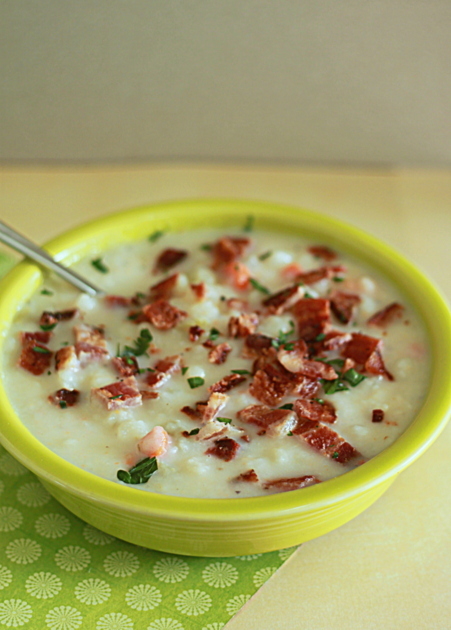 I am making this right now sans the carrot and added butter and bacon fat (no bacon available) to add body to the soup. I’m fighting bronchitis and wanted something easy to make and comforting. Thanks for posting! Yummy can’t wait to fix it.